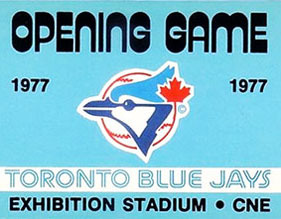 Baseball is back in the great white north, signaling spring revival, while also commemorating the 40th anniversary of the Blue Jays’ inaugural game (April 7, 1977) at snowy Exhibition Stadium on the north shore of Lake Ontario. While it was an entertaining 2016 down at the ballpark known previously as the Skydome, last year once again ended in disappointment, this time dealt from a team based on the south shore of Lake Erie. 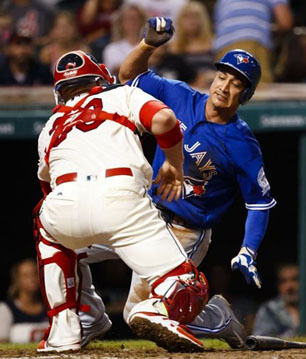 An omen of things to come — Aug 20, 2016, Cleveland, OH : Toronto Blue Jays second baseman Darwin Barney is tagged out at home by Cleveland Indians catcher Chris Gimenez in the sixth inning at Progressive Field. Mandatory Credit: Rick Osentoski-USA TODAY Sports. The Blue Jays, who had finished with an 89-73 mark during the regular season, beat the Orioles in the wildcard game and Rangers in the division playoffs, but were stymied by the Cleveland Indians in the ALCS. Once again they were denied their first trip back to the World Series since they last won in 1993. This has also not been an especially pleasant offseason for long standing fans. In a perfect world, the Toronto Blue Jays would still be showcasing Edwin Encarnacion and Jose Bautista, Major League Baseball’s most prolific power hitting duo for the past seven years. But during an offseason where the Jays absorbed more than their fair share of curveballs, Encarnacion flew the coop to the Cleveland Indians, as a free agent in a rather sloppy divorce from his old team. And Bautista was left to flounder in the unwanted baggage section before being “reclaimed” by the team in late January. Debate continues to rage over Edwin Encarnacion’s messy departure from the Toronto Blue Jays, with emotional fans split between blaming the team for being cheap and not getting a deal done, and the iconic slugger and his agent for aiming too high in their demands. The primary question many Blue Jays fans keep asking is why things played out this way when there was so much common ground between player and club. Edwin in an earlier incarnation. Edwin Encarnacion (whose 11th-inning home run to beat Baltimore in last year’s AL wild-card game will live on in Blue Jays lore) had always called Toronto his “first choice” in free agency following the season. Yet he turned down the original four-year, $80-million US offer from the Blue Jays, expecting to hit it big on the open market or to finagle more money out of the Rogers coffers. 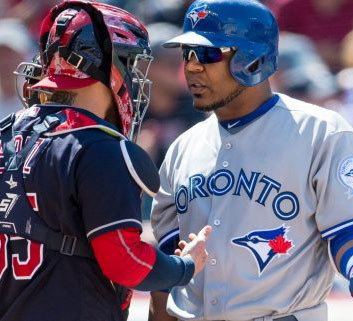 Timing though is everything, and what is particularly painful, is the divergent timeframes for a decision between Encarnacion and the Blue Jays that masked the common ground between them. 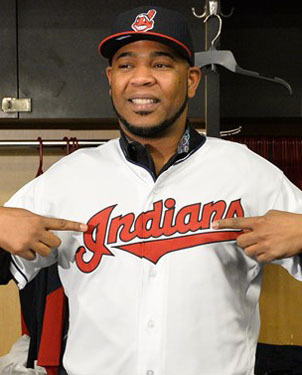 Toronto by moving quickly and “negotiating” aggressively at the beginning of November, in a take-it-or-leave-it offer, were essentially trying to force Encarnacion to forgo exploring the open market where he could get a sense of what other options he might have. It was understandable for Encarnacion to be prudent, since this was the one opportunity to max out his earnings, and any player who enters free agency should do his due diligence; no one likes leaving money on the table. At the same time, the Blue Jays balked at his reticence and moved rapidly to sign his replacement; the much cheaper Kendrys Morales to a three-year $33 million contract. Yet as the market played out, Edwin later signed with Cleveland for much less than the Blue Jays offered (three-year deal that guarantees $60 million), and the Blue Jays now look to have paid too much for Morales, as similar players to him got significantly less money and guaranteed years this off-season. And that is the painful part, for both club and player clearly wanted a different outcome at the outset, yet events and tight Rogers purse strings conspired to split them apart. He deserved better. Edwin Encarnacion’s loss will be tough to overcome both on the field and at the box office; he remains one of the best power hitters in the game, and his popularity was a big reason the Blue Jays led the league in attendance. He was the Blue Jays’ best player in 2016, belting 42 home runs with 127 runs batted in, and now goes to Cleveland, the team that beat the Jays out and who may be their principle competitor in their effort to get to the World Series. Yet perhaps the biggest loss will be with the fans, who will miss his consistent production, his effervescent smile and jovial good nature, and perhaps most, the parrot walk as he circles the bases after a long home run. Since 2010 Edwin Encarnacion and Jose Bautista formed the most fearsome power tandem in the game, combining for 480 home runs. 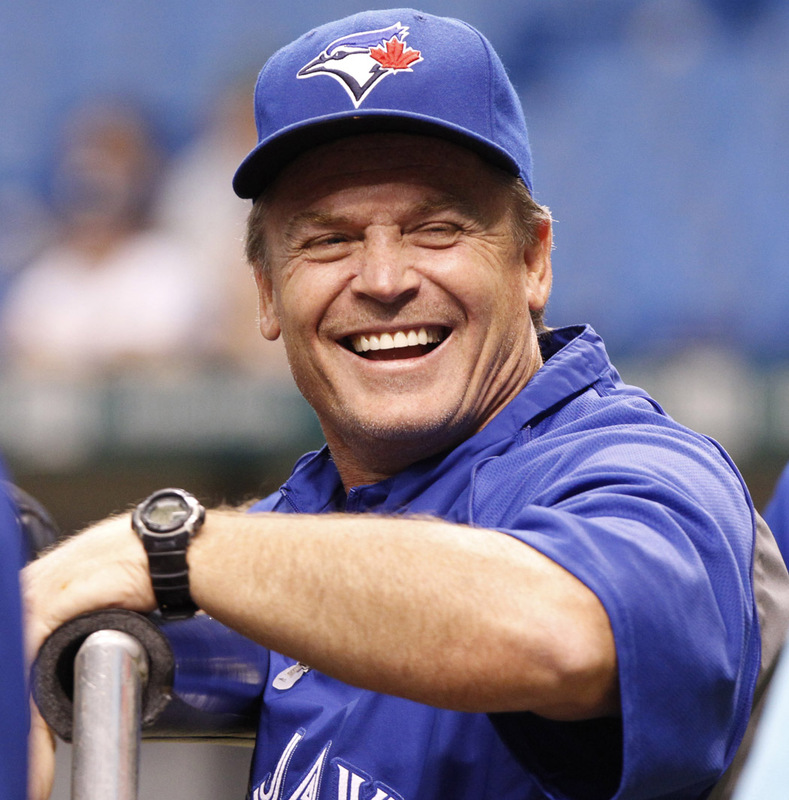 Yet only one of the two sluggers who helped turn the Toronto Blue Jays into a contender will still be playing ball north of the border this season. Unfortunately for the Blue Jays, it’s not the one they wanted the most. Edwin and Jose in days gone by. 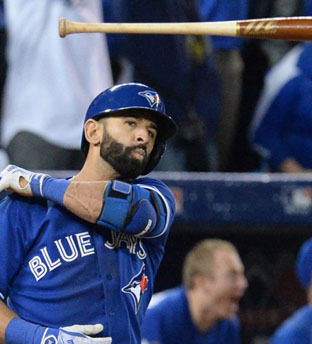 The consensus heading into spring training a year ago was that the Jays would rather sign Jose Bautista to a contract extension, but that fellow pending free agent Edwin Encarnacion was more likely to accept one. Bautista reportedly tabled a take-it-or-leave-it demand seeking a new five-year deal worth an eye-popping $150-million if the Blue Jays wanted to retain his services. Regardless, he never signed a new deal and stumbled through an injury-marred 2016 season where his production slipped, heading into off season free agency as a large question mark. As mentioned, at the outset of November it was Encarnacion the Blue Jays pursued aggressively (and quite unsuccessfully) while Bautista was placed on the back burner. In a market where the interest for sluggers throughout Major League Baseball was stagnant, Bautista was not exactly a hot commodity and languished on the open market. It’s not a huge surprise nobody was willing to offer up an extended deal considering his advanced age (36), and the fact that he missed a significant chunk of 2016 due to injury and didn’t play all that well when healthy. Bautista played a total of 116 games last year, producing at just a .234 clip with only 22 home runs—his fewest since 2008. Yet when teammate Edwin Encarnacion bolted for the Cleveland Indians, and with fans beginning to ask questions about the front office’s slow play of two club favourites, Toronto’s interest in bringing Bautista back started to thaw. At the same time, the Blue Jays had also run out of better options in free agency while their work on the trade market sat at an impasse. 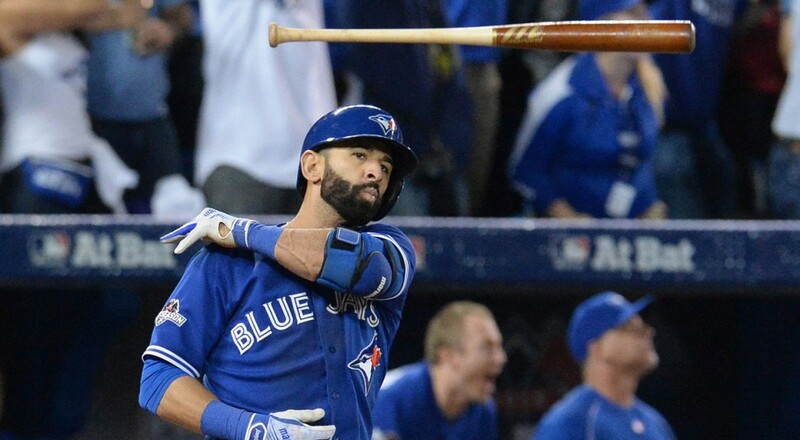 With a nudge from Rogers ownership, who sensed growing fan discord, Jay management finally circled back to Bautista signing him to one-year deal worth a guaranteed $18-million. 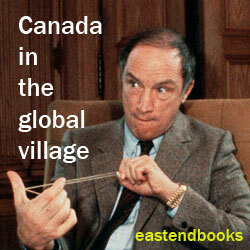 And he never wavered in saying Toronto was where he wanted to be all along. The reunion with Bautista should help pacify the restive portions of the fanbase, wondering why more hadn’t been done this off-season to bolster a core good enough to contend again for the postseason. Yet one of the more intriguing questions about Jose Bautista’s return to the Toronto Blue Jays was how the two sides were going to package this. Clearly there’s a feel-good narrative to be spun here — iconic slugger and the club he’s starred for reunite. It’s valid to some degree, and was surely how things were dressed up during spring training. 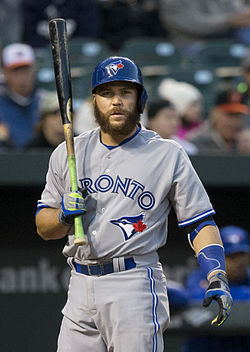 But if we’re being real, this was a late-January leverage play between a team that sifted through a host of preferred options before circling back to Bautista, and a 36-year-old right-fielder who wanted to stay put all along and didn’t find a more appealing alternative while the Blue Jays played the field. Not exactly an open-arm embrace for a dearly missed loved one. So now they have another year together, which may very well work out brilliantly, and for Blue Jays fans who love Bautista and haven’t liked what they’ve seen in the off-season, some order to their world is restored. The fans have a franchise icon back, maybe not the one they preferred this off-season, but perhaps the one they really wanted all along. A big season from Jose would go a long way to heal all wounds. Kendrys Morales at spring training in Dunedin, Fla., Sunday, February 19, 2017. THE CANADIAN PRESS/Nathan Denette. Blue Jay management went into the off-season seeking to get younger and more athletic but aren’t all that much different than they were a year ago – only a year older. To that end, with the return of Jose and signing of veterans Kendrys Morales and Steve Perice the Jays have a lineup that is once again the oldest team in Major League Baseball, with 15 of its 25 members on the wrong side of 31. It poses the question : how much longer can the Blue Jays ride this thing before they have to get out and push? Windows of contention in sports usually have a shelf life of 2-5 years, and it is possible that the Jays’ championship window has finally started closing. This isn’t really something unique to them ; perpetual contention is out of the grasp of most any club with very few exceptions, usually delineated by time, place, personnel, injuries, and other extenuating situations rather than mere payroll. 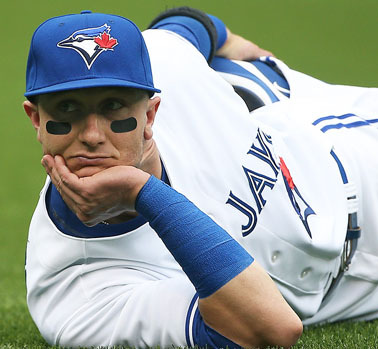 So a key question now before the Blue Jays after consecutive trips to the American League Championship Series is how much longer the current window will remain open? Josh Donaldson greets mother on the field at old Skydome last year (er Rogers Centre now), April 2016. Without doubt they are a legitimate contender for a postseason berth this season, but what happens if things go sideways as they have in the first week of the season? Complicating matters is that the Blue Jays’ prospect base, while now closer to the big leagues, can’t be counted on to cover roster holes or injuries to a roster of players (Donaldson, Tulowitzki, Martin, Travis, Morales, Pierce, Bautista) that has a history of getting banged up. The makeup of the roster has been approached very cautiously by present management. Every contract, from Morales, Pearce and Bautista this winter to Marco Estrada and J.A. Happ last year, has been of a length and dollar figure that still allows management to keep their options open. If the team unexpectedly founders this season, there are many possible in-season moves that could net the type of prospects which move the team in a different direction with a younger core of players. The window is closing on this veteran group, but I don’t think this is the year it shuts! For all that was made of the Toronto Blue Jays’ juggernaut of an offense heading into last season, it wound up being the starting rotation that was the team’s biggest strength. The Jays’ pitching staff surprised everyone in 2016 by finishing with the best team ERA (3.64) in the American League and sixth overall in baseball. Their 100 combined quality starts tied with the World Series Champion Chicago Cubs for the highest number in the league. Just five teams allowed fewer walks, and no AL team held opponents to a lower batting average (.236). The starting pitching, arguably the best in the AL last year, remains the team’s strength and it has a chance to be even better in 2017. All the key hurlers who finished with the team last season are returning, led by lefty 20-game winner J.A. 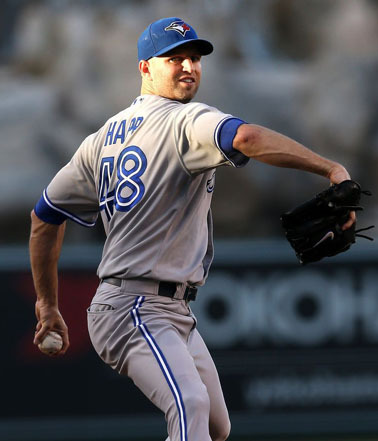 Happ, who surprised most in baseball by finishing second in the American League in wins. 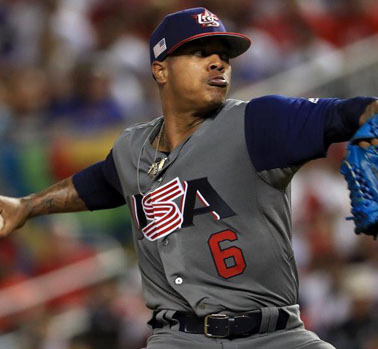 Marcus Stroman, fresh off a masterful starting performance for the United States in its championship victory over Puerto Rico in the World Baseball Classic, appears poised to deliver consistently for Toronto and he has the confidence and swagger to match. Aaron Sanchez, whose 2016 workload was closely monitored, posted the lowest starter’s ERA (3.00) in the AL. His .882 win percentage (15-2) was baseball’s best among qualified pitchers, and his electric stuff has him poised to once again challenge for the Cy Young award as the league’s best pitcher. Marco Estrada, who made the all-star team but could not play because of a bad back that bothered him all year, reports he is still dealing with sporadic back pain but is in a much better spot than a year ago and is throwing harder in his first two outings of the season. Finally, Toronto is perhaps most excited about the prospects of Francisco Liriano, the other lefty in the starting rotation who was a trade deadline addition to the team last season. Liriano, although roughed up in his first start, had been lights-out during the spring, posting a 1.88 ERA with 25 strikeouts during 14 1/3 innings. Marcus Stroman : fresh off a masterful starting performance for the United States in World Baseball Classic 2017. The Blue Jays starting five in 2016 were remarkably healthy as they had an amazingly low total of just seven starters. Health then will be the key, as after their formidable starting five, the starting pitching depth is a bit sketchy, with a huge drop off in quality among the reserves in Buffalo. The Jays’ bullpen has undergone a bit of an overhaul but will look to lean on Roberto Osuna at the back end. Still only 22, Osuna has emerged as one of the game’s top young closers, posting 56 saves over two years. Last season Osuna garnered 36 saves in 42 save opportunities but he was pushed hard in the late season and playoffs. Some concern has been expressed this spring about a bit of a drop in the velocity of his fastball, which usually ranges in the mid-to-upper 90 miles an hour. Viz., he started the regular season on the disabled list with a cervical spasm that will be closely monitored. The middle innings though could get dicey. The free-agent departure of Brett Cecil created a couple of issues: a setup void and a vital need for a left-hander. Right-handed relievers Jason Grilli and Joe Biagini return, and Toronto in the off-season agreed to deals with veteran lefty J.P. Howell (4.09 ERA, 1.40 WHIP with the Dodgers last season) and veteran righty Joe Smith (3.46 ERA, 1.25 WHIP with the Angels and Cubs last season). As good as 22-year-old Roberto Osuna has been in his first two MLB seasons (56 saves, 9.8 K/9, 0.93 WHIP), he can’t protect a lead if the middle relievers can’t deliver one to him. And with him on the shelf with an injury in the first week the other relievers weaknesses have been exposed. Troy Tulowitzki in the field. Credit: Tom Szczerbowski, Getty Images. Toronto might need all the collective optimism on the pitching front, because the offense doesn’t seem as high-octane as we might expect from the names listed on the lineup card. They finished middle of the pack (8th) in the AL in hitting (OPS+) last year, and that was with Josh Donaldson continuing to play at near-MVP levels. As mentioned, the most glaring difference will be the absence of Edwin Encarnacion, who hit 42 home runs lead the team, while also tying with David Ortiz for the league lead with 127 RBIs. Yet Encarnacion-sized hole be damned, it’s hard to look at a lineup anchored by Josh Donaldson, Jose Bautista, Troy Tulowitzki, Kendrys Morales, Russell Martin and Devon Travis and be unimpressed. To wit, the PECOTA baseball projections have Toronto pegged for the AL East Division’s best offence. 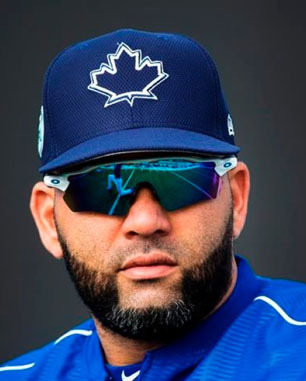 Notwithstanding the shotgun marriage/reunion with Jose Bautista, Kendrys Morales, the new switch-hitting designated hitter, is being counted on as the de facto middle-of-the-order presence and replacement for Edwin Encarnacion. 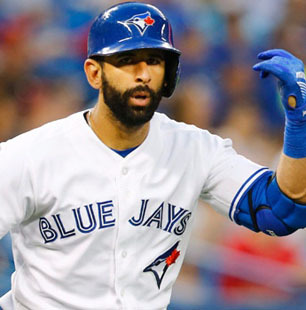 If Bautista can return to form following an injury-plagued 2016 campaign, the addition of Morales, along with hitting stalwarts Josh Donaldson at third base and shortstop Troy Tulowitzki, should all help in generating offence down at hitter-friendly Rogers Centre. Yet the lack of overall athletic dynamism makes the team once again over-reliant on the home run and its inherent station-to-station approach. Fact is, if the Blue Jays don’t slug they don’t win, as was evident in last year’s ALCS loss to the Indians. This also is quite precarious considering the lineup is one year older and power production typically does decline with age. This will put increased pressure on the perennially injured Devon Travis to play a bulk of the games at second base. When healthy, he has shown to be a spark plug for the offense at the top of the batting order. Without him, the lineup is weaker as it lacks a natural lead-off hitter to get on base and set the table for the middle of the order. His health will be paramount, and in the opening week still looks to be suffering from off-season knee surgery to repair an injury that occurred in last year’s playoffs. The Toronto Blue Jays ended a long absence from the postseason fray in the past two seasons but suffered disappointing exits in each, falling in the American League Championship Series to the Kansas City Royals and the Cleveland Indians. Toronto’s elite pitching staff and loaded offense should have it in the playoff conversation once again. On the other hand, competing in an always-rugged American League East, where the division champion Boston Red Sox only got tougher with the addition of left-handed ace Chris Sale, Toronto will have its hands full to match last season’s 89-73 mark. And in 2017 the margin for error is smaller as the Blue Jays have a scary lack of player depth. It’s a team that’s still in win-now mode, but if it continues the poor play exhibited in the first week of the season and it becomes clear that the season is no longer about winning, then — actually, we’ll stop there for now. They still have a clubhouse of very strong personalities, which means they could go either way. Any team that has a clubhouse core built around Josh Donaldson, Troy Tulowitzki, Russell Martin and Jose Bautista is going to be into it. Every inning. Every at-bat. Every pitch. Every day. Every week. From start to finish. This team plays with an edge many teams lack. 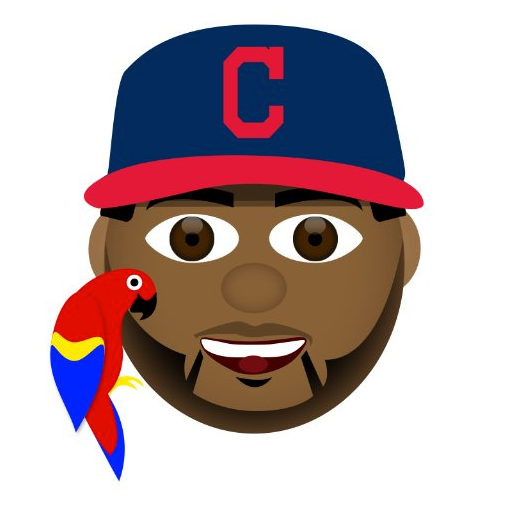 It is going to be a fun and exciting summer in Toronto…and it may very well be that in order to get to their goal of the World Series they will have to get by Edwin and his parrot this fall. So, it is time to sit back and enjoy. Baseball is back in the great white north. Love reading his Blue Jays preview every year! Despite a rough start , I think Pillar is going to emerge as a stronger player. But I do miss the pelican! !